The Bears had high hopes for third-round draft pick Brandon Hardin. Though he missed most of his senior year with a shoulder injury, the Bears were excited about what Hardin could bring to the safety position, which has been a revolving door since Smith was a coach. But after a neck injury, Hardin was put on the injured reserve and is expected to miss the entire season. 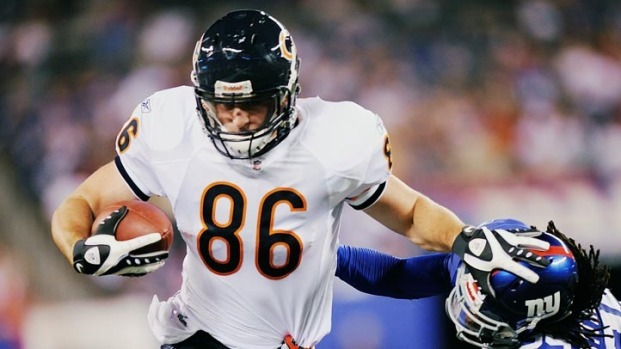 On Sunday, the Bears announced Hardin would be put on injured reserve. He was injured in the pre-season game with Washington. Hardin laid motionless on the grass for a while and had to be taken out on a backboard. He was released from the hospital the next day, and never lost feeling in his arms and legs. However, the injury is extreme enough to make the rookie miss his entire first year. "Disappointing whenever you have a plan in place for (a player)," Bears coach Lovie Smith said. "Injuries are a part of it. After you have a collision like that and you lay on the turf, him playing isn't the first thing on your mind. I'm glad he'll be OK. These things happen. As a rookie, a lot of players had to go on IR their first year, and normally you learn an awful lot that year being out of football." After watching the tackle again and again, it's not surprising to see Hardin come out with an injury. On the play where he was injured, Hardin tackled with his head down. It's a tackling style that players usually avoid because it is so likely to result in a serious injury both in the tackler and the tacklee. From Pop Warner football on, tacklers are taught not to tackle with their head down. Hopefully, Hardin will use this year to get back to what the Bears brass saw in him when they used their third pick on him.